was born in Kurashiki (Japan) in 1958 and did his undergraduate and graduate studies at The University of Tokyo. After working at Shionogi Research Laboratories, Shionogi & Co., Ltd., as a research chemist, he was appointed as an assistant professor at Ehime University in 1988. He was a visiting scholar at Stanford University from 1992 to 1993. He joined Gakushuin University as an associate professor in 1994 and was promoted to full professor in 1997. He is a recipient of the Chemical Society of Japan Award for Creative Work (2009), Daiichi-Sankyo Award for Medicinal Organic Chemistry (2009), Nagoya Silver Medal (2012), Arthur C. Cope Scholar Award (2016), and Humboldt Research Award (2016). His current research interests include the development of new and useful synthetic methodologies based on the design of novel chiral Brønsted acid catalysts as well as the utilization of transition-metal catalysts. 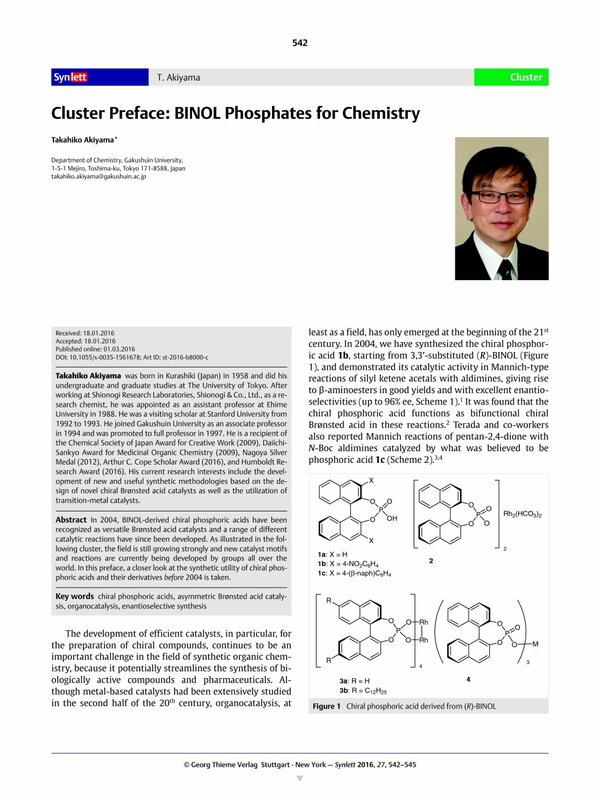 In 2004, BINOL-derived chiral phosphoric acids have been recognized as versatile Brønsted acid catalysts and a range of different catalytic reactions have since been developed. As illustrated in the following cluster, the field is still growing strongly and new catalyst motifs and reactions are currently being developed by groups all over the world. In this preface, a closer look at the synthetic utility of chiral phosphoric acids and their derivatives before 2004 is taken.